A memorial gathering for the victims of the New Zealand mosque terror attacks took place on Friday (March 22) in the Islamic Centre of Ireland in Blanchardstown, Dublin. The gathering was held after Jumah (Friday) Prayers one week to the day after the atrocity. 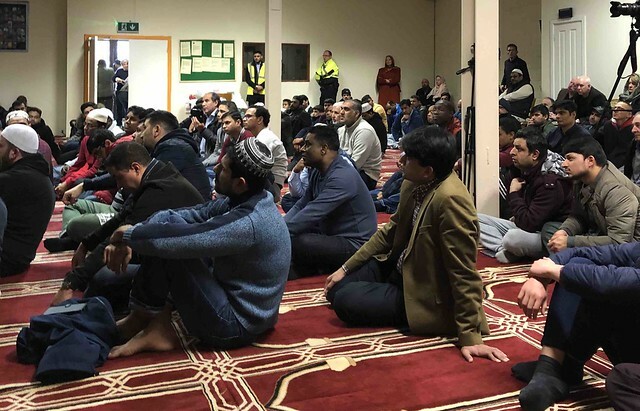 Following verses from the Qur’an and the Jumah Sermon there was a Call to Prayer and a minute’s silence in memory of the 50 people who were killed in the Christchurch mosque shootings. There were also Funeral Prayers for the victims. The gathering was addressed by New Zealand’s Ambassador to Ireland, Brad Burgess, Archbishop Michael Jackson, Rabbi Zalman Lent, and the head master of Castleknock College, Christopher Kinder, who spoke in Te Reo Maori. The memorial concluded with all participants holding hands for a minute’s silence. 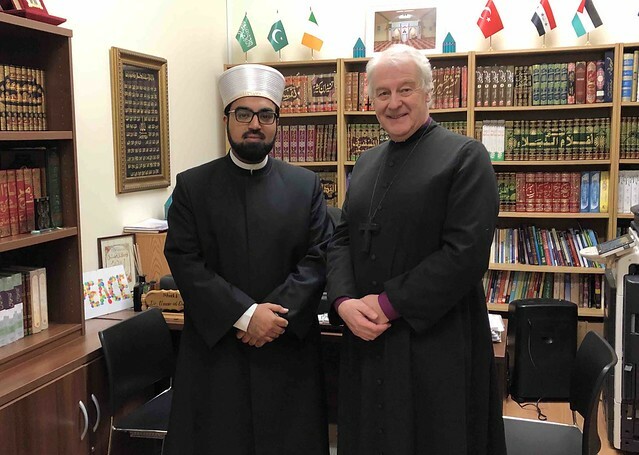 In his address Archbishop Jackson expressed sympathy, sadness and solidarity with the Muslim people of New Zealand, all the people of New Zealand, and with Muslim people in Ireland. “My priority is to express sympathy and sadness both on my own behalf and on behalf of all who journey with me in sorrow. I do so as a fellow human being and also on behalf of the Church of Ireland and the Christian tradition. I express such sympathy and sadness along with a deep sense of outrage and tragedy that even one person at prayer should die through calculated and premeditated violence. I express it to the Muslim people of New Zealand, the total population of New Zealand and to the Muslim people of Ireland with whom I have had the privilege and opportunity to work creatively and constructively for almost ten years now,” he said. “The sympathy and sadness I share with you comes also with solidarity. It is a solidarity that transcends geography and time; it is a solidarity that unites race and gender, older and younger; it is a solidarity that confronts the invasion of wilful violence into the spaces of peaceable prayer,” he continued. Archbishop Jackson also talked about the Dublin City Inter Faith Charter, a ground breaking initiative between the Dublin City Inter Faith Forum and Dublin City Council, which aims to build cohesion and create societies of inclusion and encourage dialogue of people of different beliefs and faiths. “The Charter commits ‘to create social conditions that will allow all to share peace, joy and hope.’ The Charter is a pledge of solidarity, on the part of those who pray, to a pluralist and post–secular society and an expression of our commitment to contribute – if we are allowed by inclusion to do so,” he explained. Echoing the words of his counterpart, Archbishop Diarmuid Martin, earlier in the week who asked where the church–state dialogue mooted by An Taoiseach during the visit of Pope Francis had disappeared to, he suggested that a new dialogue needs to reflect the diversity of faiths in Ireland. “Irish society today challenges almost every form of dominant conformism. And it does so on sound philosophical presuppositions. If we start from the observation that ‘my centre is your margin and your margin is my centre’, we start also with the realization that ‘I am An Other to those whom I call Other’. Christchurch, in all its devastation and in all its tragedy, has injected a further perspective that will not go away: ‘They are we and we are they’. The diversity of Faiths needs to be integral to the new dialogue in Ireland as elsewhere in the world. We need once again to work together to this goal and with a renewed energy. Our challenge is the real work of pulling together, with all stakeholders and policy makers, secular, religious and political, the areas in between you and me, the areas in between us who are all too easily divided into being Other to each Other. People of faith, people of society together can do this through human curiosity, human hospitality and human understanding. We need each other to build and to maintain a dynamic society of diversity, inclusion and expression in Ireland today,” he said. The full text of Archbishop Jackson’s address is available here.